Good Books / Bad Covers is a new feature/weekly meme here at Bookish Wanderess. The idea behind it is to say "Hey, I know this book has a really bad cover, but the book itself is really good. You should read it!" So every monday I will be choosing one book or book series that I read and really liked, but it has a really bad cover, and I will talk about why that book deserves a chance even if the cover is so bad that I wouldn't pick the book up in a bookstore even if it was free. Everyone is welcome to join this meme, I just ask that you link back to me in your post. 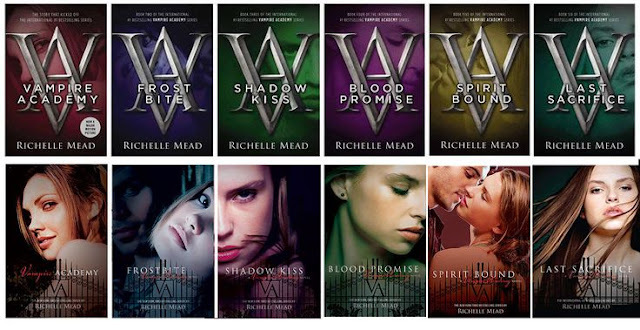 And while I was thinking about this series, I remembered the other, more popular Richelle Mead series and their really ugly covers. You know which one I'm talking about? Well, you are right! I'm talking about the Vampire Academy series and the Bloodlines series. Here are the new and old covers for the Vampire Academy series. They changed the really ugly covers it used to have, for covers a little less ugly, but much more boring. - Richelle Mead writes quick, easy to read and entertaining books. - BUT she still breaks your heart from time to time. - Her stories are really interesting because she mixes different creatures: vampires, alchemists, succubus, demons, angels, imps, nephilims, and others. There a lot of creatures! - She writes great female characters; they are complex and very different from one and other. - She writes great love stories, and there are ships for everyone, because there are all kinds of relationships. And that's it! If you haven't given these books a chance because of their covers, please do it! I hope you enjoyed this post! If you make a Good Books/ Bad Covers post, please let me know in the comments, I would love to check it out!